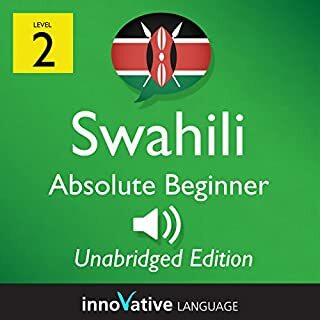 Start speaking Swahili in minutes and grasp the language, culture, and customs in just minutes more with Absolute Beginner Swahili, a completely new way to learn Swahili with ease! 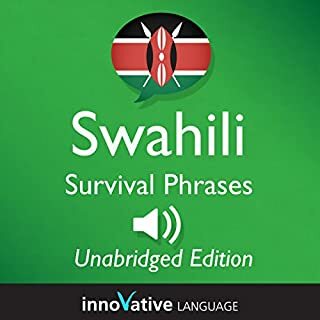 This audiobook is a new way to learn and speak Swahili fast. Start speaking in minutes with powerful learning methods that you'll learn inside. Using this audiobook is simple. You'll learn practical phrases for over 400 daily activities through 10 easy chapters. The phrases were chosen by a panel of professional language teachers and are some of the most frequently used phrases in daily conversation. Had some experience in Swahili? Up the challenge with Beginner Swahili. Master the basics of Swahili conversation! 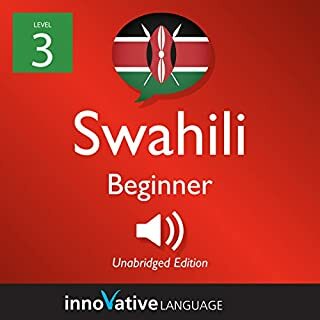 Start speaking Swahili in minutes, and learn key vocabulary, phrases, and grammar in just minutes more with Beginner Swahili. Our native Swahili hosts break down all the sentences, grammar and more in a simple, easily understandable way! Do you want to learn Swahili the fast, fun, and easy way? And do you want to travel to Kenya and get around like a pro? Then this is the audiobook for you. 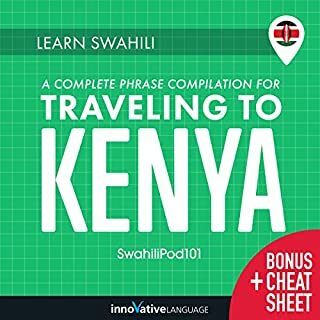 Learn Swahili: A Complete Phrase Compilation for Traveling to Kenya is designed for absolute beginner learners and travelers. You learn the must-know travel phrases, survival phrases, vocab, and cultural insights to make your trip to Kenya a breeze. All were hand-picked by our team of Swahili teachers and experts. Start speaking Swahili in minutes, and grasp the language, culture, and customs in just minutes more with Survival Phrases - Swahili, a completely new way to learn Basic Swahili fast!Survival Phrases - Swahili will have you speaking with proper pronunciation from the very first lesson and prepare you with cultural insight, travel tips and other information to utterly shock and amaze your friends and family, travel companions and people you meet along the way.Are you about to travel to Kenya? Ready to speak and understand Swahili at an intermediate level? This audiobook is great for intermediates ready to go past basic phrases. Our native Swahili teachers break down all the sentences, grammar, and more in an easy-to-understand way. You learn conversations, key vocabulary, phrases, and grammar all in one shot. Kenya - Culture Smart! provides essential information, ensuring that you arrive at your destination aware of basic manners, common courtesies, and sensitive issues. These concise guides tell you what to expect, how to behave, and how to establish a rapport with your hosts. This inside knowledge will enable you to steer clear of embarrassing gaffes and mistakes, feel confident in unfamiliar situations, and develop trust, friendships, and successful business relationships. The course consists of lessons centered on an audio blog that is completely in Swahili. These audio blogs take you around Kenya and introduce you to many different aspects of this country, including culture, history, folklore, arts, and more. Master Swahili with Learn Swahili - Word Power 2001. 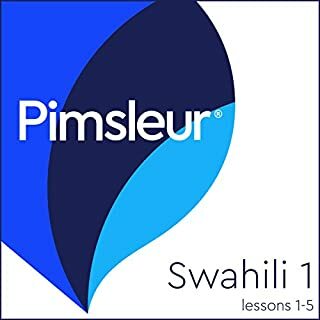 This audiobook is a completely new way to learn Swahili vocabulary fast - and for free! Start speaking Swahili in minutes with the powerful learning methods you will master in this book. Master Swahili with Learn Swahili - Word Power 1001. This audiobook is a completely new way to learn Swahili vocabulary fast. Start speaking Swahili in minutes with the powerful learning methods you will master in this book. By: Kiswahili na Utamaduni Ltd.
A Kiswahili language course for beginners in 50 lessons, complete with grammar references. 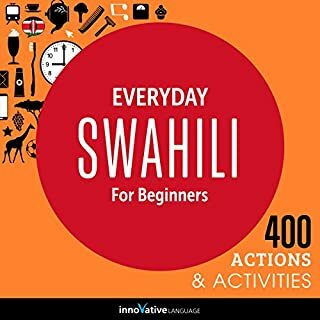 This audiobook will take you through the basics of Swahili with Basic Bootcamp, All About, and Pronunciation lessons. The five Basic Bootcamp lessons each center on a practical, real-life conversation. At the beginning of the lesson, we'll introduce the background of the conversation. After the conversation, you'll learn carefully selected vocabulary and key grammar concepts. Next, you'll hear the conversation one time at natural native speed. Finally, practice what you have learned with the review track. In the review track, a native speaker will say a word or phrase from the dialogue. Repeat the words and phrases you hear in the review track aloud to practice pronunciation and reinforce what you have learned. In the fifteen All About lessons, you'll learn all about Swahili and Kenya. Our native teachers and language experts will explain everything you need to know to get started in Swahili, including how to understand the writing system, grammar, pronunciation, cultural background, tradition, society, and more -- all in a fun and educational format! The five Pronunciation lessons take you step-by-step through the most basic skill in any language: how to pronounce words and sentences like a native speaker. You'll go from basic concepts to advanced tips and will soon sound like you've been speaking Swahili your entire life.